Products were sent from Collectively for review. Happy October, everyone! I am so excited for what's coming up on the blog in the next few weeks. Aw yeah, it's Halloween time, guys! Let me know if you are looking for any specific looks for your costume in the comments. I'd love to try out some out-of-the-box looks! But before we even get started on face paints and what not, it's always a good idea to make sure your skin is in good shape. On top of that, I don't know about you guys but as soon as there's a chill in the air, my skin needs some tender lovin' in the form of sweet, sweet skincare. 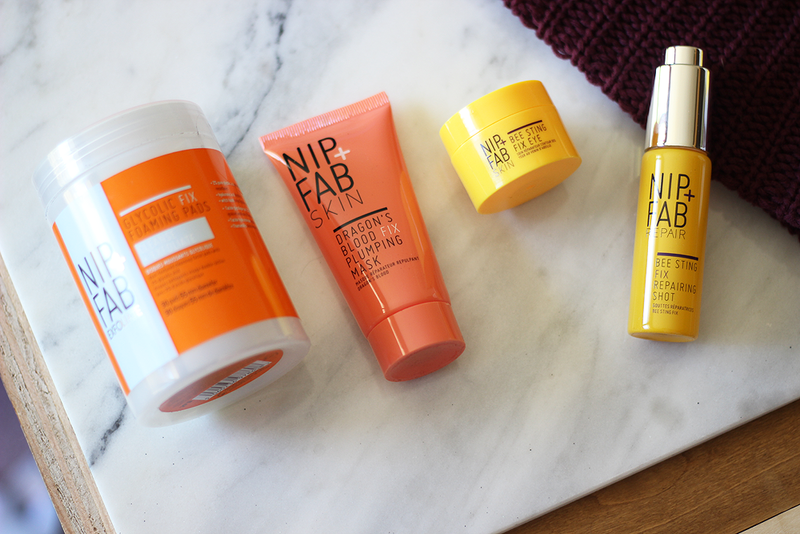 A few weeks ago, I was sent some of the newest goodies from Nip + Fab and honestly like, what better timing, am I right? Let's check out what they sent and my thoughts on them! 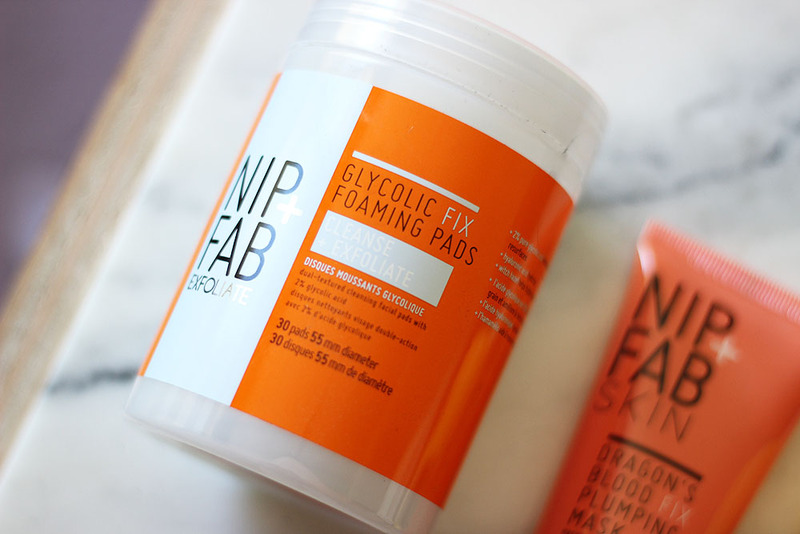 Glycolic Fix Foaming Pads ($15) - Oh man, I love these little guys! These double-sided pads are soaked with glycolic acid and other moisturizing ingredients to cleanse your face and leave it nice and clean. What's really cool about these is one side of the pad is kind of coarse to exfoliate your skin while the other side of the pad is smoother to polish it. The little tub comes with 30 little pads (so $2 a pad). PS. Do not use this around any delicate parts of your face like the undereye area. Dragon's Blood Fix Plumping Mask ($14.95) - Did you know that Dragon's Blood is from the Croton Lechleri tree and not from the mythical creature I had imagined in my head? I kid although I'll admit I'm slightly disappointed. Anywho, if you're looking for super hydration, this is where it's at! It contains a moisturizing cocktail of dragon's blood, salicylic acid, hyaluronic acid, glycerin and TEGO comic C 250 to brighten, plump and hydrate your skin. I really like using this overnight for maximum hydration. 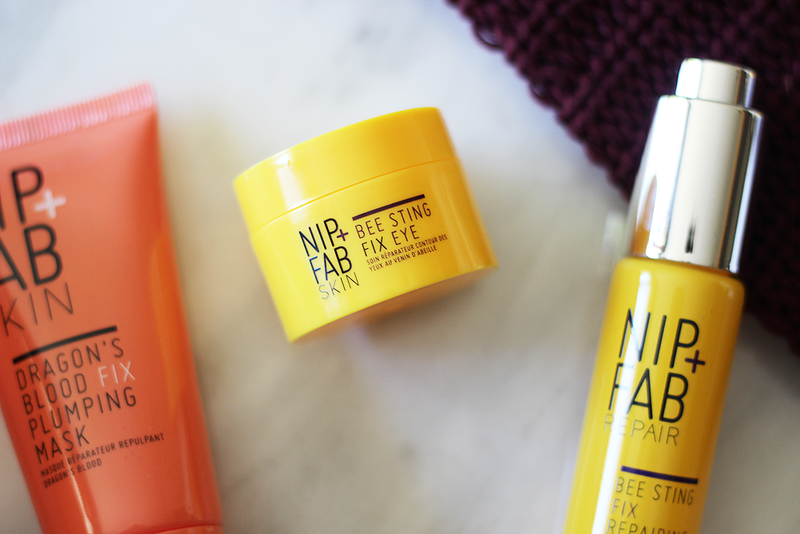 Bee Sting Fix Eye Cream ($12.99) - Truth is, until recently, I never used eye creams. That is until these dark circles showed up from my sweet, sweet children never sleeping! So I was thrilled to give this one ago! It has a mix of bee venom to plump and firm, manilkara leaf to improve skin tonicity and amino acid to brighten dark circles. I apply this before I start my makeup routine and give it a few minutes to soak in and noticed that it definitely deflates my bags enough to make it look like I got at least five hours of sleep. HA! Warning: Do not use this if you have an allergy to bee stings. Bee Sting Fix Repairing Shot ($24.99) - I've been using oils to prime and moisturize my face lately (I've been loving the results!) so I was excited to try this out and add it to my routine. It's a super lightweight oil that you can mix into your moisturizer or serum that hydrates and repairs dry skin. It contains hyaluronic acid, royal jelly and bee venom to condition, plump and restore the skin through hydration. I use this before my foundation for a nice base but I've also added this into my nighttime routine for added moisture. Warning: Do not use this if you have an allergy to bee stings. Which product would you add to your skincare routine? You can find Nip + Fab at your local CVS or ULTA Beauty.